I take issue with the first paragraph of Anna Gerber’s review, ‘8vo: On the Outside’ (Eye no. 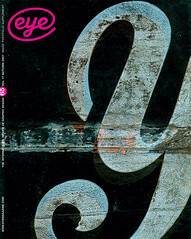 59, vol. 15). She doubly misleads the reader and fails noticeably to really define the context, prevailing design group mentality, and real impetus behind the formation of 8vo. I shared a flat with 8vo’s Simon Johnston at the time – and the first Factory records sleeves were produced ‘on the kitchen table’. Gerber states that 8vo formed with an ‘idea-driven approach’, and at a time when ‘style was to the fore’ in the shape of the triumvirate of Brody / Garrett / Saville. This is simply not the case. Their railing was not against the few designers who were treating the public to the re-worked design ideas of the earlier part of the century and calling it new – and at least these practitioners had some interest in typographic quality. No, their problem was exactly with the sort of ‘idea-driven’ design that came from the majority of design groups in London at the time: image-led heritage-graphics concepts for crisp packets, and the use of quirky, clever illustration rather than robust design elements and clear communication. Having said that, the rest of the review is quite readable. Editor’s note: As we went to press, news came of the death of Factory Records founder Anthony Wilson.